What do Panther Chameleons look like? The Panther Chameleon shows a small casque in both sexes, when compared to a Veiled Chameleon, with the males being more "bulbous" than the females. Panther males are smaller when captive bred than in the wild, reaching about 19-21 inches in captivity, females are noticeably smaller. Males are very brightly coloured when compared to females, showing bright colourations indicating their locale. Females are usually the same peachy colour regardless of locale. Panther chameleons have a long prehensile tail used in the same way as other chameleons, they also show the same characteristics as other chameleons such as visibly protruding eyes which move independently of each other and the ability to change colour dependant on mood. Where are Panther Chameleons from? 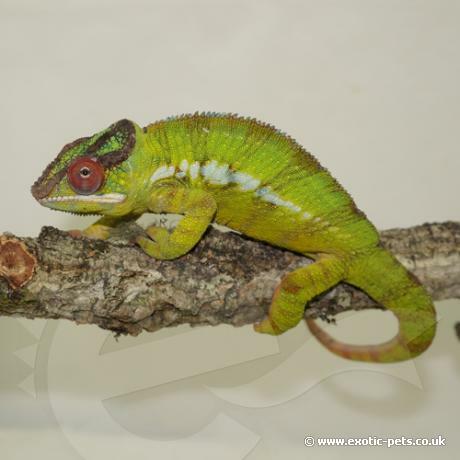 The Panther Chameleon is native to Madagascar, and is found in a wide array of colours variations. Nosy be, Sambava, Ambilobe, and Ambanja are some of the most commonly bred types of Panther Chameleons and are named after the town/island in Madagascar where they were found. How do you keep Panther Chameleons? Panther Chameleons are fairly hardy in captive care although not advised as a beginner's reptile. You will need a mesh enclosure of at least 4ft, 6ft is preferable if you intend to keep a male. Males and females should not be kept together; neither should two males as Panther Chameleons are solitary creatures. Females can be kept together providing the enclosure is big enough. A UV strip bulb is required as is a heat bulb. Chameleons will bask under a heat lamp to warm themselves up, they will also seek out cooler areas of the enclosure to cool down. The heat bulb should be placed at the highest part of the enclosure with the strip bulb being situated so that the chameleon can sit 12 inches away to utilise the UV rays effectively. Provide a daytime temperature of 24-26.5C (75-80F), with a basking area of 29.5-32C (85-90F). Allow the temperature to drop down to 18C (65F) during the night. The use of a thermostat is essential to keep your enclosure to the correct temperature. Panther Chameleons enjoy a humidity of around 50-70%, this is easily achieved in a mesh tank by regular daily misting, a drip system and having real plants such as ficus trees in the enclosure. Chameleons will drink from any water they can see moving in the enclosure such as drips off leaves and whilst being misted. They will eat around 4-5 days out of the week, gut loaded insects such as locusts and crickets which should be dusted as follows. Use a calcium carbonate with NO D3 on every feed, a calcium carbonate WITH D3 1-2 times per month and finally a multivitamin such as REPTIVITE WITHOUT D3 1-2 times per month.